Mossley, or as the locals pronounce it Mozz-Leh, hadn’t been on my radar until very recently (despite it being another sub 40 miler for me that I’d overlooked, along with other Manc area clubs Flixton, Irlam and Trafford). 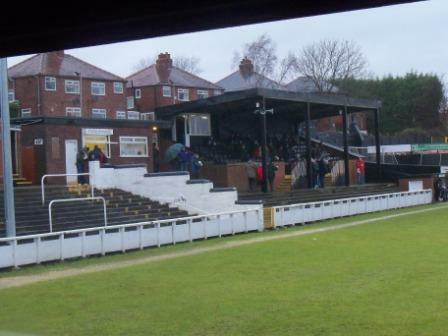 I’d been drawn to it lately because of rave reviews from seasoned groundhoppers and Tom, a Darlington fan who’d been there in the FA Cup. Hoppers on a non-league forum, some with over 500 grounds under their belts, were hailing it as one of their favourites, so I put it to the front of my to do list and made sure it was a Saturday game, so I could see it in the light. Not that there was much light on this Saturday. I couldn’t have picked a more miserable day to visit. An unrelenting downpour from dawn till dusk was accompanied by an eldritch and all encompassing greyness that consumed the day in its melancholy; the god of weather was morbidly depressed. The rain falls hard on a humdrum town, this town has dragged you down. 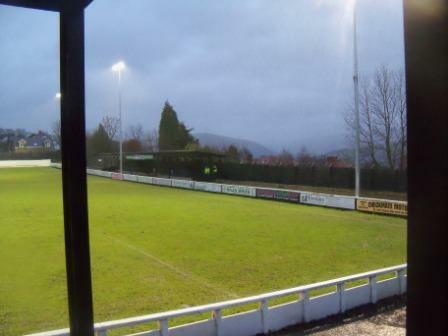 Relieved that the game was still on I arrived at the very old ground of Seel Park, that Mossley have occupied for almost 100 years, since 1911. The club itself is slightly older than that, formed in 1903 as Park Villa. As you come in you enter upon a nice large bank of terracing in which an old stand nestles, as if the terracing came after. The snack bar resides on this side too, with the usual fare and prices on offer. Talking of prices, £7 entrance and £2 programme seem to be de rigueur for the Evostik second tier leagues. 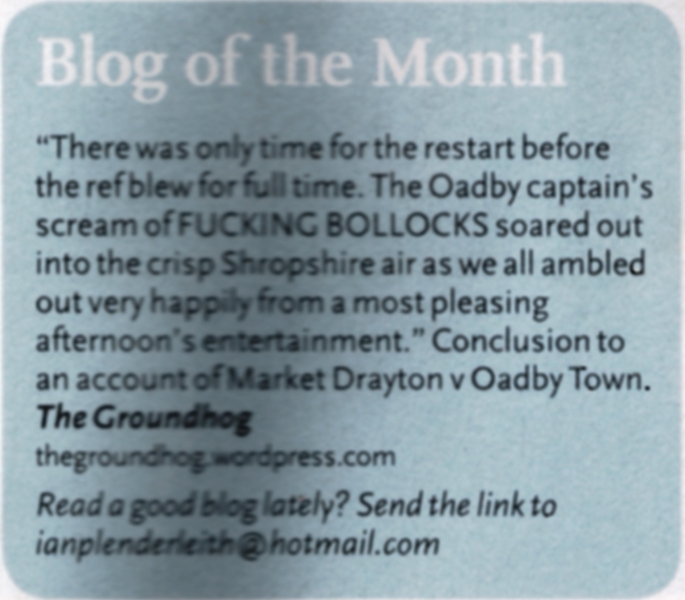 You get the odd £1.50 programme (and at Leek just £1.20) but generally the prices are the same. There is a covered terrace to the right of this side from which you get nice views of the valley beyond the town centre. The othe long side just houses a small covered terrace. The game started with such promise; if only the last eighty nine minutes could have matched the pace and excitement of the first. As it was, the vast majority of the game mirrored the weather in every aspect. Warrington belted out of the blocks, with some excellent approach play and passing which resulted in an inswinging cross which was met two yards out by Salmon who volleyed confidently into the net in a minute. (I saw Salmon last year and was very impressed by him then). Warrington’s light shone bright but fizzled out before even 90 seconds had elapsed. That was it for them. After that it was a miserable game played mostly in the middle of the pitch, with little to detract from the incessant downpour. Mossley’s equaliser deservedly stopped either side from getting more than a point. A one star match and a four star ground. 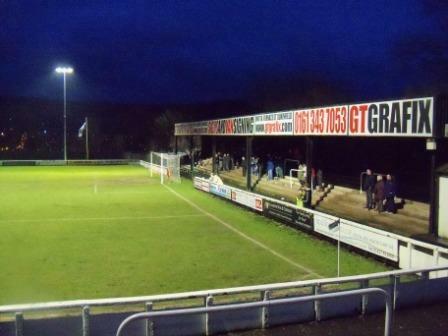 This entry was posted in Groundhopping, Non-League, Travelog. Bookmark the permalink. Please could you send me the link to the string on the non-league forum that you mention? Sounds interesting. 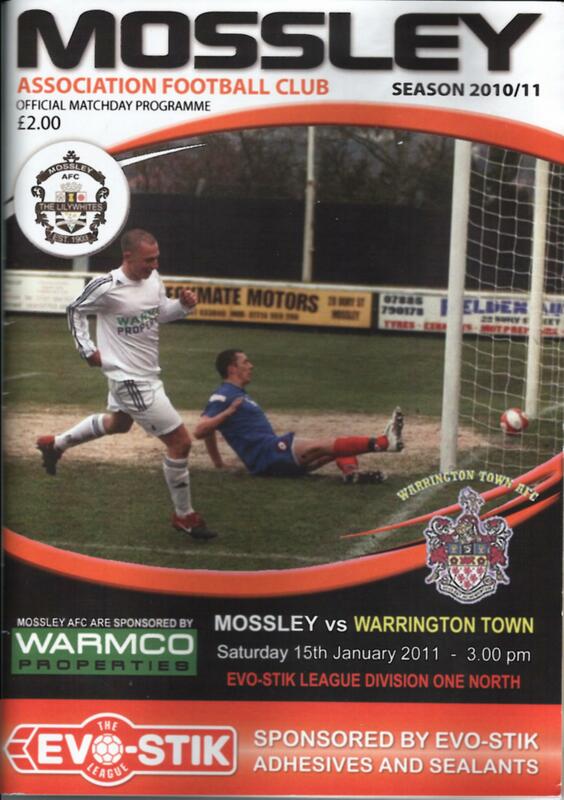 I went to Mossley at the start of this season – on a much brighter day. See my blog for how it looks in the sunshine! The Site is this: Tony’s forum – as for the exact topic I’m not sure but I think it was in the ‘Where did you go?’ section. 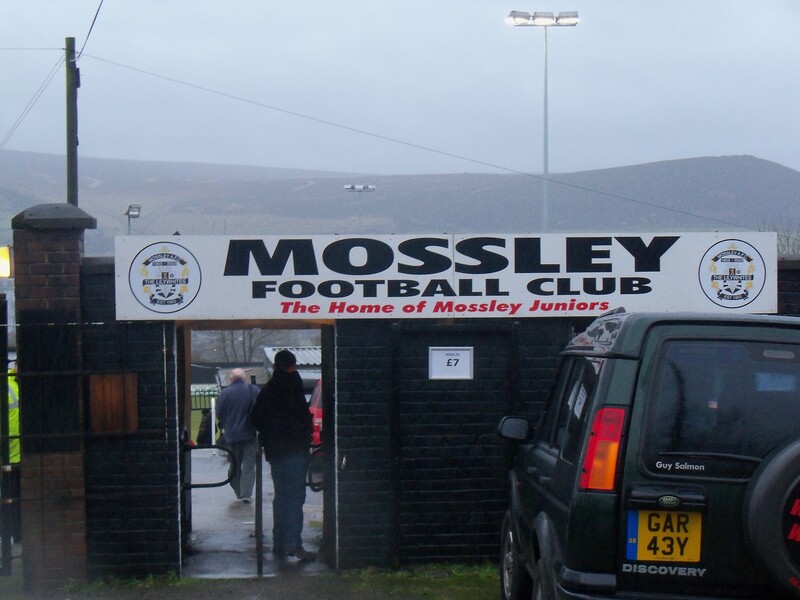 If you type in Mossley in a search you should get to any comments about it. It is a great site – have you registered on it?